Cool and calm: Matthew Ruane finishes off his goal against Kerry in impressive style. Photo: Sportsfile. Well, he certainly got a response - an emphatic one. I'll gladly eat a huge slice of humble pie after declaring a league final spot was beyond Mayo’s reach a few weeks back. I presumed Dublin would go the remainder of the league unbeaten and that Kerry had practically already qualified, making it impossible for Mayo. Now a league final appearance is a real possibility. A win for Mayo on Sunday against Monaghan and a Tyrone victory against Galway in Omagh, will throw us into a league final against Kerry the following week. Things become a little more complicated if both Mayo and Galway win and Roscommon somehow get the better of Kerry. That scenario would leave Kerry, Mayo and Galway all joint at the top on 10 points each; however Kerry's and Mayo’s superior scoring difference would also see us make it to the final to play the Kingdom, unless Galway were to give Tyrone a proper trouncing - which I can't see happening. Should Galway and Mayo both lose, Tyrone would leapfrog them both and qualify for the final. To keep things simple, we need Tyrone to do us a favour and we need to beat Monaghan. Let's not forget, Monaghan will be playing for their lives, knowing a win will guarantee them a spot at the top table for the 2020 national league and they will certainly be no walkover, despite their poor form after defeating Dublin in round 1. I expect a huge crowd in Castlebar on Sunday to help roar Mayo over the line while the majority will be keeping up to speed with the ongoings in Omagh. Mayo's display in Tralee was certainly good for the feelgood factor around Mayo football. The performance certainly has everybody feeling upbeat again about the season, after being disillusioned after the previous two displays. I'm not sure if anyone was brave enough to take it on but the bookmakers had given us little hope of getting anything in Tralee and were offering Mayo a very generous 3/1 to win the game. Kerry don't like playing us at home and Mayo haven't been beaten on Kerry soil since 2009, winning the last five encounters down there, which is a very satisfying statistic from our point of view. Mayo had some stand-out performers in Tralee. Kevin McLoughlin's inclusion in the starting line-up proved crucial as he tormented the Kerry back line. His astute running and calmness when he had the ball was a telling factor in the outcome of the game. Matthew Ruane has taken over the mantle from Fionn McDonagh as our next great white hope. 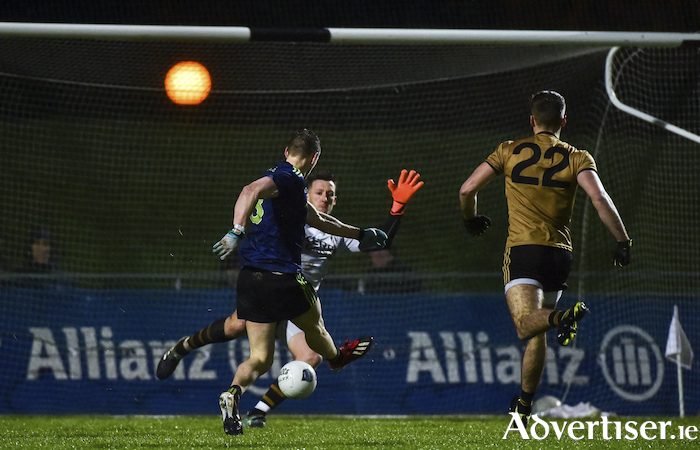 Ruane put in a towering display at Midfield for Mayo. After watching him for Breaffy in last year's county final against Ballintubber, I was undecided about his potential. I felt that game was an ideal opportunity for him to lay down a marker to James Horan- that I'm the man to replace Tom Parsons - but his performance that day didn't do him justice. He seemed to lack confidence in his ability and was unwilling to drive his team forward and often relied on the safety of a sideways or backwards pass to keep possession. Fast forward five months and he seems like a different player, getting on the end of many Mayo moves instead of just holding the middle of the pitch. He scored a peach of a goal, at a crucial time after some brilliant vision by Kevin McLoughlin to pick him out with a perfectly weighted pass. Ruane also pointed from play and only for a smart save from Brian Kelly, he could have had two goals to his name. The old saying of fortune favours the brave couldn't be more true in his case. It's great to see him driving at the opposition goals and not being afraid to take on a shot. I think it's also important to mention his mother Laura hails from Charlestown - so we can claim a bit of him over this way. It has been widely documented that Aidan O' Shea has been shot shy for Mayo throughout this year's league but when you see what he is capable of with and without the ball - shooting becomes irrelevant. He was a battering ram and a wrecking ball last Saturday in Tralee in what was a herculean display from him. Kerry players dropped like skittles when he ran at them with ball in hand to set up numerous attacks. His ball-winning ability in the middle third was phenomenal and his tracking back and tackling was top drawer. It won't bother me if he fails to take shots on if he plays like that every week. He deservedly won the man of the match award. I think I speak for everyone when I say consistency is now the key and that starts with a victory over Monaghan on Sunday. The performances against Dublin and Galway are forgotten about after last Saturday. Mayo must back up the Tralee performance with another win against Malachy O' Rourke’s team. Mayo 4/7; Monaghan 7/4; draw 15/2. What more can you say about Corofin - apart from they are a joy to watch and deservedly won their fourth All-Ireland club title in emphatic fashion. They play the most exciting brand of total football which is very easy on the eye. They have now won the last two All-Ireland club finals by a combined total of 27 points. It's hard to believe they needed a Micheal Lundy injury time point to rescue a draw against Mountbellew/Moylough in the Galway County final.